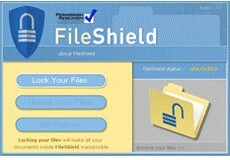 FileShield 1.1 free download. FileShield, from Permission Research, lets you easily encrypt and decrypt specified files and folders using just one password. FileShield, from Permission Research, lets you easily encrypt and decrypt specified files and folders using just one password. FileShield, from Permission Research, lets you easily encrypt and decrypt specified files and folders using just one password. Once locked, these files and folders cannot be deleted or moved. FileShield will store files and folders locally on your computer in its own FileShield folder. Although this FileShield folder can be seen through Windows Explorer, its contents can't be viewed unless unlocked with your unique password. When using your computer, you can lock or unlock the FileShield folder as needed. As an additional measure of security, the folder can be automatically locked after a period of time that you specify, or whenever you shut down your PC. Most everyone has files or folders on their computer that they do not want to share with others. Folder Lockbox is an application that will enable you to password protect any folder on your computer. Microsoft Private Folder is a useful tool for you to protect your private data when your friends, colleagues, kids or other people share your PC or account. RPS bulk copy will copy files/folders into a folder structure at locations that you set. Allows user to add or remove attributes of files or folders. The goal of this free cryptographic add-on to mirc is to provide secure and transparent encryption. Advanced Cypher is a set of two tools.